Post news Report RSS	Alpha 0.5.10 released! Alpha 0.5.10 released. Important features: In-game mail system, inventory management overhaul, ui settings panel, bug fixes, new metrics, achievements, and sounds. We are getting down to the wire as far as beta is concerned. There remain but a few more features to implement, so keep your fingers crossed for a late January or February beta release date! Thanks to everyone who voted for us last month in the SlideDB App of The Year awards! Because of your help, Lugdunon was first chosen as one of the Top 50 Apps of 2013 and then went on to place 2nd in the Best Upcoming App of 2013 category. 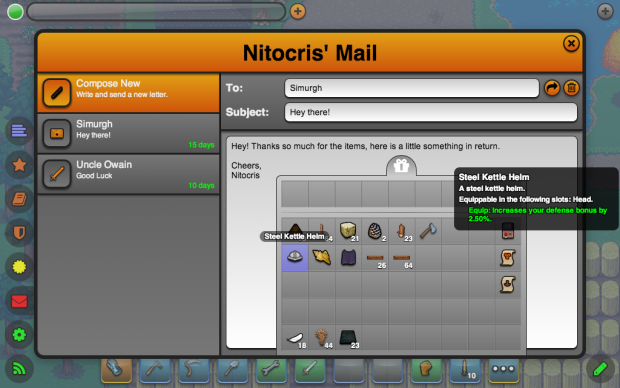 The in-game mail system allows for players to send each other messages and items, whether or not the recipient is currently online to receive them. 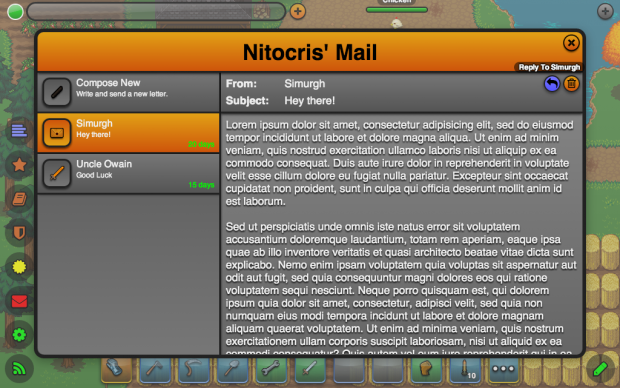 The mail UI can be accessed by clicking the mail icon in the lower-left of the game screen. Normally green, the mail icon will turn red (and show the number of unread and total messages currently in your mailbox) if you have unread messages. 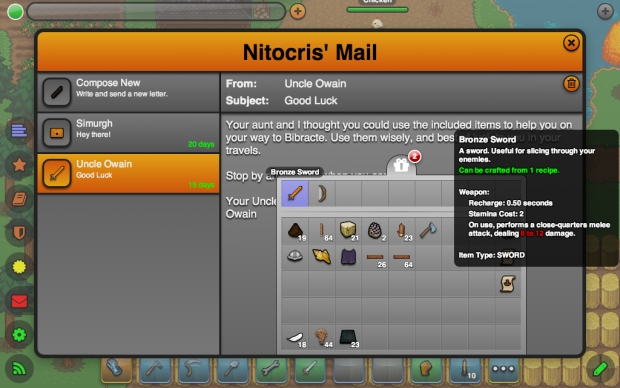 Mail can be sent by players, and even by NPCs based on certain player actions (quest completion, achievement earned, etc). Mail can currently only be sent to other players. Mail cannot be sent to yourself. Items can be retrieved from mail, or added to your current draft. Your draft will be saved automatically for you until you decide to send it. Something of note for modders: a new, pure CSS, small round icon button element has been added. All of the small rounded image buttons will eventually be converted over to use this element. The methods in which you interact with your inventory have been entirely rewritten to behave in a much less cumbersome and more natural way. A secondary method has been implemented that allows for a simple and intuitive toggle button method more suitable for tablets and other touch devices. The two methods can be toggled between using the new UI settings panel. Supported modes are auto-assign, swap / merge, leave one, take one, and split. 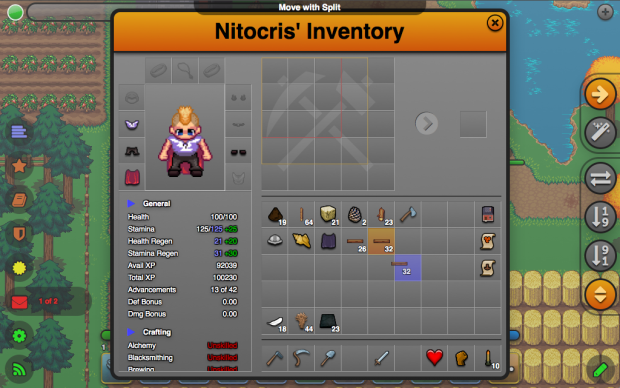 Before, a player would interact with their inventory by using a single-button, drag and drop approach with modifier keys used to split stacks. The new system leverages both mouse buttons, uses only a single modifier key (shift) to trigger auto-assignment of items and operates in a click-to-pick up and click-to-drop manner. Once an item has been 'picked up' in the initial click, the selection will show on the cursor. By initially clicking a stacked item with the right mouse button, the stack will be split and the active half will be placed when the destination slot is clicked. By initially left clicking a stacked item and then right clicking an empty or like-item-occupied slot a single item from the active stack will be assigned to the destination. 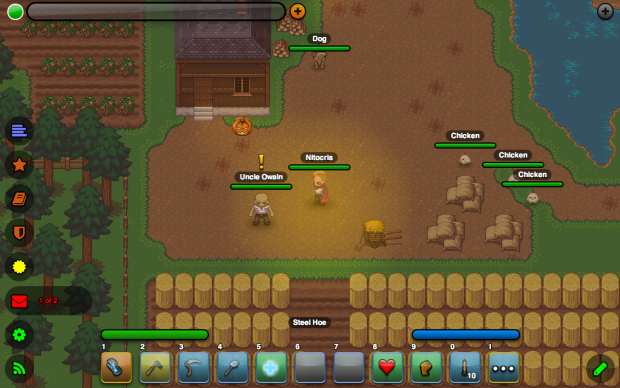 Lugdunon has had an array of flags that determine the display of certain elements, some for debugging, since nearly the beginning of the game client. They used to be toggled via the /displayflag command. Now they have been converted to use the newer setting API and have been renamed ui flags. The /displayflag command still remains, but has been remapped to /uiflag. In addition, there is now a User Interface settings panel that allows for a more accessible method of toggling these flags. 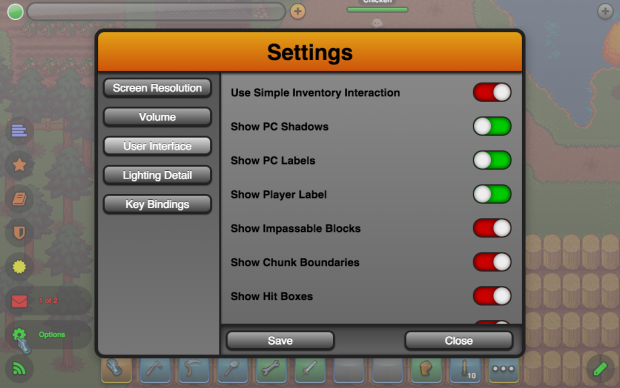 A new UI control, the toggle button, has also been added to facilitate this. Here they are in action. 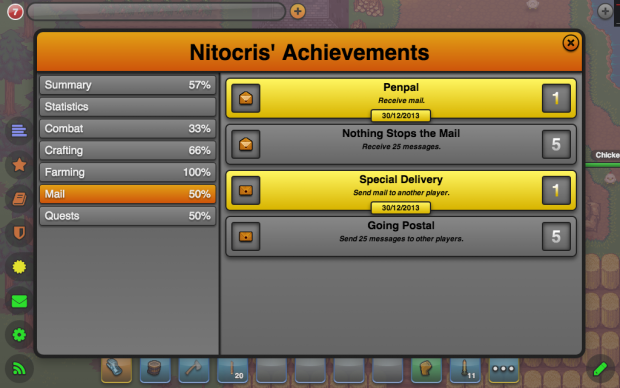 With the addition of mail, several new metrics and achievement types have been added. 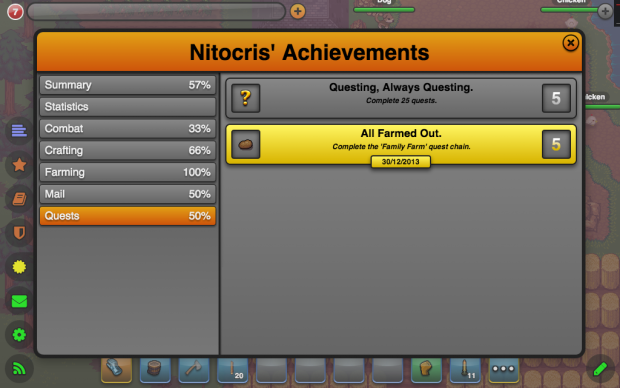 There are now metrics for tracking mail sent, mail received, and quests completed. There are also new achievement types for cumulative mail sent, cumulative mail received, and quests completed (both specific and cumulative). Instance transitions in FireFox resulting in a black screen, and occasionally in stuck progress bars in Chrome. CSS is now a primary source type, preventing the long-standing 'sticky' styles issue when first loading in new styles. Another long-standing issue involving erroneous input retriggering which sometimes resulted in an unwanted tooltip displayed while a dialog is visible. Added a reference count to game.input.listen() and game.input.listen() calls to insure that proper behavior is observed even with nested listen / ignore groups. DataView.writeLargeString() causing errors when the input is an empty string. Accounts were failing to load if a macro contained a syntax error. If a syntax error is encountered, the macro will alert the player to the fact when the macro is triggered. There was a NaN display error in net.lugdunon.state.character.advancement.def.DefaultCharacterStats. setHealthRegenText(). Not any longer! As always, the full change log for 0.5.10 is available here. It is really coming together and looking very solid. Keep up the great work! I can't wait to join in on a session. I did see notes for the modder community and was wondering if you are also writing a modding guide as well or if you are leaving it for them to figure out? Either way, it will add longevity and exposure in a great way. I have started the modding API documentation over at wiki.lugdunon.net. It is in need of some updating and major fleshing out. The plan is to start focusing on that once beta hits.